Today I am grateful for all the critters that frequent my garden. Yes, yes, I know they are not all great to have around, but if it weren’t for the snails, slugs, beetles and aphids (and dare I mention the mole), I think life in the garden would be a whole lot less interesting. And with the bad come the good … earthworms, pranging mantids, geckos, bees and the butterflies, to mention a few. Oh, the lovely butterflies, how I am enjoying them at the moment. We allowed the cabbage we were growing to be consumed by what seemed like a gazillion caterpillars and the reward is hundreds of white butterflies all over the garden! Too gorgeous for words. So for all the critters that visit my garden, I am truly grateful! Photo – Cleome: I have these growing (against the odds) in my shaded back garden where they currently stand over a metre tall. I planted them believing them to be annuals, early this year, and they have flowered continuosly since I planted them in February, right through summer, autumn and winter and now in spring. According to the literature I’ve read they prefer sun … for me they are thriving in shade. Amazing plant! Wish I had more. Cleome: Cleome flowers, with many opening at once, grow in airy racemes, or clusters of flowers, six to eight inches in diameter. 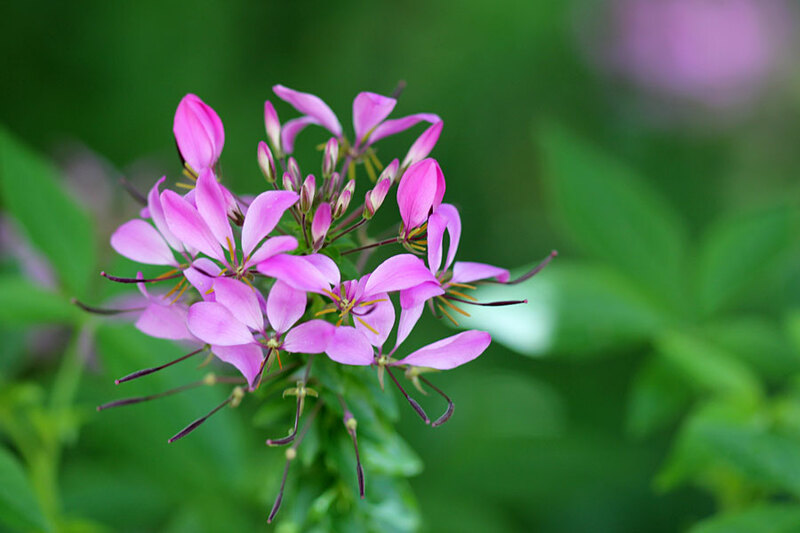 Cleome flowers come in white, pink, or lavender. They perch atop stems that grow up to six feet high. 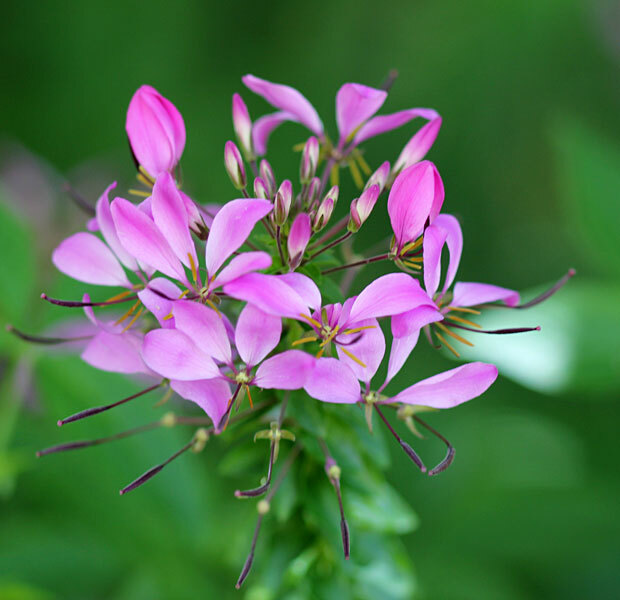 Cleome grows well in average soil located in full or nearly full sun. It is very drought-tolerant, though it will look and grow better if it is watered well. Space spider flower plants one to three feet apart. Cat of The Whimsical Gardener, has invited Garden Bloggers the world over to join her in the 30 day challenge of posting a photograph and sentiment that you are thankful for – every day for 30 days. Find something you are thankful for every day, for 30 days, can’t be too difficult, can it? See all Barbie’s and my posts filed under “30 Day Challenge“. I agree…it is one of the main reasons I garden now…critters!! Geckos? You have geckos? I don’t remember seeing any photos of geckos… please make this a goal for this summer! Also, unless you’ve been removing the seed pods (which I doubt you were), you will soon have as many cleome as you could ever want. One of my favorites, until they start getting too “long-necked”. Hi Alan, YES! I have lots of geckos, but they are very difficult to photograph because as soon as they hear me they run under cover of plants, or into crevices, under pots etc. I’ve tried … but I promise I will keep trying! Sometimes they “hang out” on the walls, which doesn’t make the greatest photo, but I will take photos of them next time anyway. Nah, I never remove seed pods – am thrilled to hear the cleome will re-seed. Mine are “long necked” already, but it works because they are planted towards the back of the bed and their “long legs” are hidden by low growing shrubs.